Douglas's Invader was the sport model attack aircraft of World War II. The original specifications laid out by the Army Air Corps called for an incremental improvement over the A-20 in service, but what Douglas delivered exceeded all performance specifications and expectations. While some A-26As were produced, the primary versions were the gun-nose A-26B and the glass-nose A-26C, with a total of over 2500 Invaders built. Shortly after WWII, an A-26 established a world speed record with payload over a 1000 km course. What confuses many people is the shifting designators of the Invader - A-26 or B-26? The answer (unfortunately) is both. In World War II, the Invader was a light bomber and designated as an attack aircraft - the A-26. After World War II, the Martin B-26 Marauder was retired and the A-26 was redesignated and served over Korea as the B-26. As the US became involved with the problems in Vietnam, the Air Force realized they needed a counter-insurgency force and a number of aircraft were drafted including the Navy's A-1 Skyraider, the T-28 Trojan, and eventually the A-37 Dragonfly. The oldest member of this team was none other than the Invader. Recognizing that the aircraft needed to be remanufactured, On Mark Engineering received the contract to overhaul and update the Invader. A new propeller, external pylons, wing-tip fuel tanks, all-new avionics, and a strengthened wing made up many of the updates that became the B-26K. The aircraft was redesignated for political reasons back to A-26A. Confused yet? 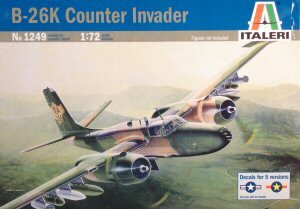 A-26A 'Counter' Invaders operated over Vietnam and 'other' parts of Southeast Asia in US and South Vietnamese markings. The aircraft operated extensively through 1970 before being withdrawn after the aircraft experienced wing failures attributed to the age of the aircraft. I usually reserve this comment to Trumpeter's impressive array of models, but here goes: WOW! Italeri has hit a home run with this release! 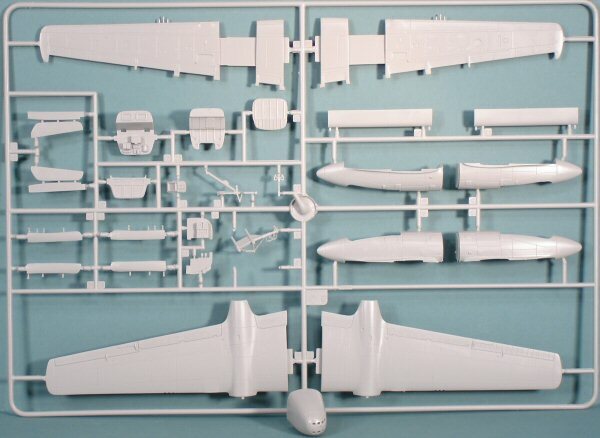 What we have here is a 1/72 scale rendition of the A-26K, but with the parts layout I see here, I am certain we'll be seeing an A-26B and A-26C in our future. 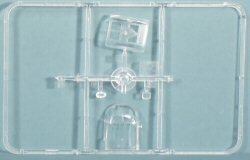 The kit is molded in light gray styrene and presented on four parts trees, plus a single tree of clear parts for the window transparencies. The exterior surface detailing is nicely scribed. Now for the most interesting part of this new kit - the cockpit. This is the most detailed cockpit I've seen in any Italeri kit in any scale! 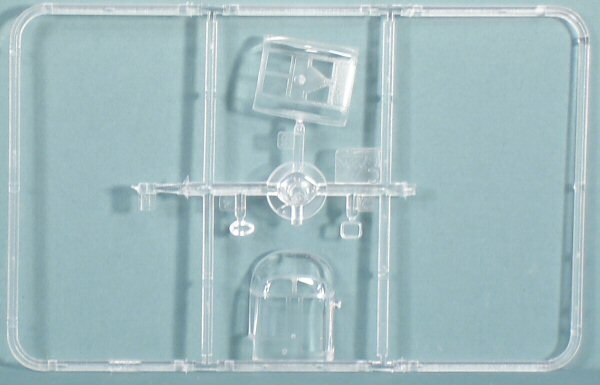 Some AMS modelers might want some photo-etch in here, but with all of the detail molded into this kit cockpit, a good painter can create all of the detail the eye can grasp through the transparencies after the fuselage is closed up. Keep this trend up Italeri! The only downside is that this cockpit configuration is accurate for the A-26B and A-26C. The B-26K had a slightly different configuration that you might chose to follow - see the UPDATE notes below. The kit provides a nicely detailed bomb bay complete with bomb load, but I honestly don't know if the Counter Invader used the internal bomb bay with all of the weapons carried externally. In any case, the bomb bay doors can be posed open or closed. Did I say this kit had a detailed cockpit? They did a great job on the entire interior. There are no less than five internal bulkheads to install inside the fuselage. One to separate the nose compartment from the cockpit, one between the cockpit and bomb bay, one between the bomb bay and rear compartment, and two more in the rear. Externally, the fuselage received blanking plates top and bottom where the dorsal and ventral gun turrets had been located during WWII. Another sign of things to come. 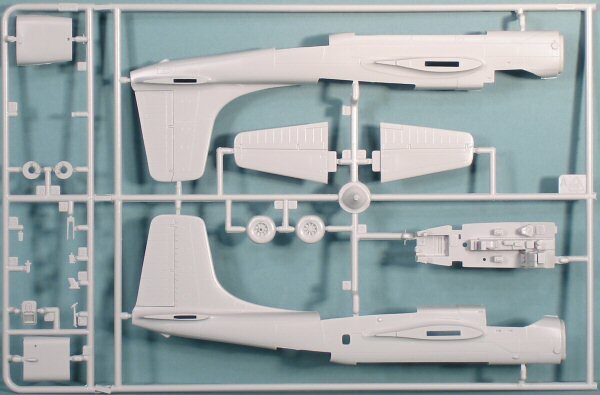 Remember to open all of the holes in the lower wing halves for all eight external pylons. 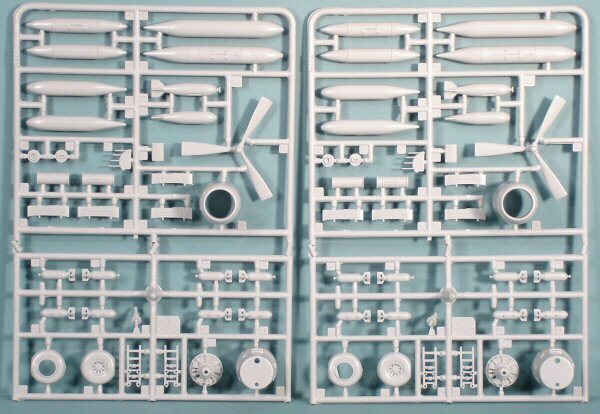 For external stores, the kit comes complete with what appears to be two external fuel tanks on the inboard pylons, napalm cans, bombs and rocket pods. A pair of tip tanks round out the load. 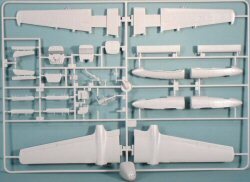 In addition to the distinctive paddle props used on the On Mark modified A-26Ks, the kit comes with all of the unique antennas used with this configuration. Read your review of the new Italeri kit. Very good, but a couple of corrections. The aircraft was, in fact designated as a B-26 by the USAFK. It was changed to A-26A, not A-26K to please the Thai government, who did not want "bomber" aircraft based in Thailand. 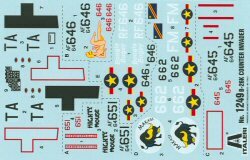 As for the kit itself, the interior is all wrong, being that of the A-26B/C with jump seat. The On Mark B-26K had dual controls, no jump seat, an extended instrument panel on the right side, etc. The tail lacks a beacon on the top and the main gear wheels are of the type used on the A-26B/C. The K model used KC-135 wheels/brakes which look very different from those supplied in this kit. 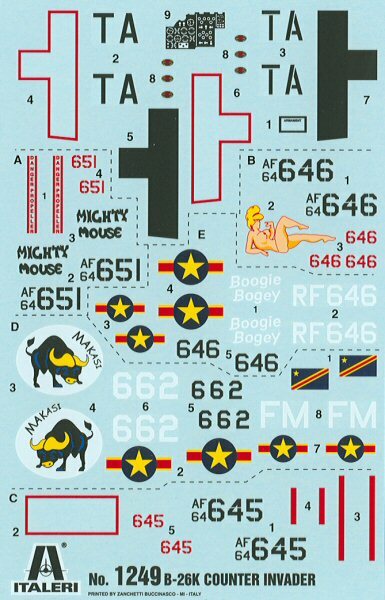 I assume that the instructions tell one to remove the 6 wing mount machine guns as only the B-26K prototype had these. See the Cutting Edge 1/48 conversion set to see what these wheels should look like. The A-26As did use the internal bomb bay while in SEA. Favorite loads were AN-M1A2/A4 incendiary clusters as well as M31/M32 "funny bombs". No one makes models of this ordnance. 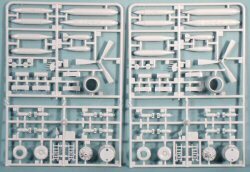 The AN-M1 cluster would be particularly difficult to mold in 1/72, but the M31/32 really wouldn't present any real problems. AN-M30A1 100 lb bombs were also carried and sometimes even 1000 lb AN-M65A1 bombs were carried. These can be obtained from many sources. I'm not sure if the kit provided bombs are 100 lb or 250 lb ones...Multiple Ejector Racks were carried on the two outboard wing pylons and were used to drop flares. Later, modified LAU-10 rocket launchers were used as flare dispensers. (SUU-20 or 25, I think). Mk 82 LD bombs with fuse extenders along with the BLU-27/32 napalm tanks were also carried on the wing pylons. In Africa, no internal ordnance was used. External ordnance was limited to 19 round rocket launchers on the outboard pylons and the nose mounted guns. I wish this kit was in 1/48 scale! This is easily the nicest Invader kit made in any scale. To start of with the On-Mark A-26K was an excellent choice, but replace those two duplicate trees and change a few mold gates and we'll be seeing the World War II A-26 and Korean War B-26 family in our future!